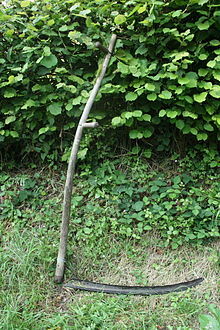 A scythe is an agricultural haund tuil for mawin gress or reapin craps. It wis lairgely replaced bi horse-drawn an then tractor machinery, but is still uised in some auries o Europe an Asie. The Grim Reaper an the Greek Titan Cronus are eften depictit cairyin or wieldin a scythe. This page wis last eeditit on 14 Februar 2018, at 02:39.